In a new study published in the journal Phycologia, researchers suggest that adding seaweed to processed foods, such as dried pasta, hot dogs, and frozen pizzas, may help reduce cardiovascular disease. Cardiovascular disease, or heart disease, is the leading cause of death in the U.S. According to the Centers for Disease Control and Prevention, cardiovascular disease results in 611,105 deaths each year. Types of heart diseases include angina, high blood pressure, heart attack, and atherosclerosis. Cardiovascular diseases are thought to be preventable through lifestyle choices. You can reduce your risk of heart disease by exercising, managing diabetes, stress, blood pressure, and quitting smoking. It’s also important to eat a healthy diet high in fiber, omega-3 essential fatty acids and antioxidants. In other words, it is up to the consumer to make responsible decisions about their health. Study author and University of Southern Denmark professor Ole G. Mouritsen argues that the food industry should also be responsible for the health of society. Mouritsen has written several books about seaweed for food consumption. In a recent article, Mouritsen and his team reviewed studies on the health benefits of 35 seaweed species. 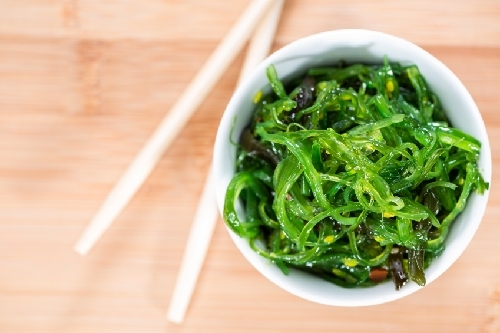 In the article, the authors suggested how the food industry and consumers can effectively use seaweed to make meals healthier by adding it to fast food. For instance, granulated and dried seaweed could replace some flour in processed breads, pastas, and other foods. It can even enhance the flavor of food. Consumers could also buy seaweed and add it to homemade foods themselves. For example, dried seaweed like nori is perfect for salads, dressings, vegetables, eggs, or fish dishes. Kelp seasoning can even replace your current saltshaker. Hijiki is used for some Asian-flavored salads, and wakame is also a great addition to miso soup. Dulse and kombu can enhance the flavor of soup. Seaweed is known for its heart health properties, such as dietary fiber, proteins, essential fatty acids (lipids), antioxidants, and angiotensin converting enzyme (ACE) inhibitors. As far as mineral content, seaweed contains potassium. On the other hand, processed foods contain high sodium, which may lead to high blood pressure. Umami is another important feature found in seaweed. Umami is thought to be the fifth basic taste, which promotes satiety and regulates food intake to help reduce food cravings for fat, sugar, and salt. “It is difficult to determine how much seaweed a person should consume to benefit from its good qualities. Five to 10 grams of dried seaweed per day is my estimate,” explained Mouritsen. In 2011, Canadian and Irish researchers at the Teagasc Food Research Centre in Ashtown, Dublin, studied the heart-health properties of seaweed. From the eight Irish and Newfoundland seaweed species’ studied, the Irish seaweed called Pelvetia canaliculata had the highest total lipid percentage per dry weight. “Seaweeds are a known source of essential fatty acids, which are thoughts to reduce thrombosis and atherosclerosis—factors important in the reduction of the risk of heart disease,” explained Dr. Maria Hayes from the Teagasc research team and Memorial University in Newfoundland. Nori is perhaps the most popular sea vegetable and it is used in sushi rolling. Other varieties of nutrient-rich seaweed include kelp, kombu, and dulse. Mouritsen, O.G., et al., “A role for dietary macroalgae in the ameliorating ration of certainement Risk Factors Associated with cardiovascular disease,” Phycologia, 2015; 54, 649-666. “Food industry can help lower cardiovascular diseases by adding little seaweed to products,” ScienceDaily web site, November 23, 2015; http://www.sciencedaily.com/releases/2015/11/151123101902.htm. “Seaweed does the heart good?” ScienceDaily web site, September 13, 2011; http://www.sciencedaily.com/releases/2011/09/110913184059.htm. “Cooking Healthy with Sea Vegetables,” The World’s Healthiest Foods web site, http://whfoods.org/genpage.php?tname=whfkitqa&dbid=23, last accessed November 24, 2015. “Leading Causes of Death,” Centers for Disease Control and Prevention web site, last updated September 30, 2015; http://www.cdc.gov/nchs/fastats/leading-causes-of-death.htm, last accessed November 24, 2015.